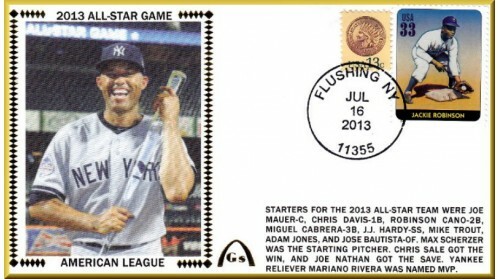 2013 All-Star American League Envelope Picturing Mariano Rivera - Unautographed. One Player Was Honored By Every Other Player From Both Sides Remaining In Their Dugouts Until This Man Had Made His Appearance On The Mound – All-Time Saves Leader And future Hall Of Famer Mariano Rivera, Who Has Announced His Retirement And Is Being Honored In Every Park Where He Plays For The Last Time This Year. We cannot Remember Another Player Receiving Such Tributes, But His Interview After The All-Star Game Was So Well Conducted We Can Understand Why So Many People In Baseball Have Developed Such Respect For Rivera – More Than Just For His Pitching.